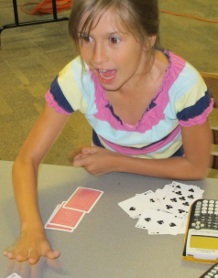 Count Me In is a math enrichment program for girls ages 6-12 (rising 1st-6th graders). Count Me In camps are designed to provide a place for girls of all ability to practice, create, and compete in math in a unique and supportive setting. Our programs are available to schools, academic summer camps and individual teachers and are set up to be run as week-long, half-day camps. We like boys. We really do. But we're passionate about providing a different setting for girls to practice math - one that is supportive, productive, and intentionally tailored to their needs. convince girls that they can have FUN doing math! Why should girls be doing math over the summer? Isn't summer the time to take a break? "Most students lose about two months of grade level equivalency in mathematical computation skills over the summer months." Each day of the week is scheduled to include both games for skills development and large group activities that get girls moving while using their math brains. Because camps are designed for two teachers with twelve campers, girls get the individual attention that is often hard to come by in a classroom setting. Small group activities at two centers – games, skills development, brain teasers, etc. Big group activity – dancing, drawing, tournaments, etc. Are camps offered for just one grade level? Not necessarily. The "Beads and Bar Graphs" program is designed for rising 1st-3rd graders and "Prisms and Perfect Squares" is designed for rising 3rd-6th graders. Camps can be offered for one, two, or even three grade levels. Are Count Me In camps all independently run? Yes. Individual teachers and schools offer Count Me In math camp programs independently within their own communities. When a school or teacher purchases a program, what is included? Everything you need to run a Count Me In math camp! Does Count Me in have a program for middle school girls? Count Me In is currently piloting a camp for rising 6th-9th graders. In addition to reviewing pre-algebra skills, this program focuses on algebra and geometry concepts while introducing the TI graphing calculator.